When it comes to planning a luxury dream kitchen, many homeowners like to consider ensuring both functionality and maximum space efficiency as part of their overall plan. An L-shaped kitchen lends itself to a medium- to large-size space and is perfect if you want to include a dining table in the mix. We suggest positioning taller pieces, such as your refrigerator, wall ovens, or the pantry closet, along one arm of the “L” shape and the main portion with your cooktop and sink on the other. With this approach, you can strive for maximum storage space, and also allow plenty of flow and movement for at least two people to work simultaneously. This style is a very popular kitchen layout for houses, is stylish, adaptable, and functional. 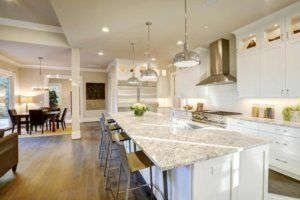 An island layout is a good option for homeowners who want their kitchen to be a hub of entertainment for family and friends. It enables the cook to socialize while also preparing food. Islands are ideal for open-plan living spaces and you can design them with built-in sinks. U-shaped kitchens are perfect for larger families or where multiple cooks prefer to work together in the space. This type of layout is flexible; it can work in long, narrow galley-style spaces, and in larger square-shaped areas featuring a central island workstation. Straight line kitchens are best suited smaller, more compact spaces. A larger-scale version of a straight-line kitchen is also an option for families who like to eat their meals in the kitchen. This layout works particularly well when your table is directly adjacent to the kitchen. A peninsula layout is an excellent solution for smaller-size kitchens that are in need extra workspace, storage, or seating. This option opens up the kitchen to the adjacent area, allowing for better circulation. We suggest thinking carefully about how you plan on using your kitchen before meeting with any prospective kitchen design contractors. One of the more common requests we receive from our clients is to design a multi-function space where homeowners and their families can prep meals, dine casually, entertain guests, work from home or help their children with homework; we believe it is a genuine reflection of the way so many of us live and operate today. The Republic West Remodeling team has developed, through our 20+ years of experience and a passion for excellence, a unique kitchen remodeling process that aims to deliver an enjoyable experience and a positive outcome for our clients in the Phoenix metro area. Contact us today to schedule a complimentary design consultation.